Shillong Lajong FC has an uphill task to accomplish when they host Mohun Bagan AC in the final leg of the Hero Federation Cup semi finals on Saturday at the JN Stadium Shillong at 5pm. In the first leg encounter which was held in Kolkata on the 8th May, Mohun Bagan had set a high score line of 5-0 and put themselves on the advantage over Lajong. Unfortunately, Singto’s boys who displayed a sensational performance against East Bengal to progress to the final four, but were unable to match up to the high intensity performances of the players of Mohun Bagan AC. The former I-League champions who finished second best in the recently concluded I-League season are also at the top of their AFC Cup Group G table and will face Singaporean outfit Tampines Rovers in their AFC Cup pre-quarterfinal in Guwahati on May 24. Meanwhile, Shillong Lajong FC, fought like warriors and proved too good for East Bengal in the first round of the Federation Cup and won by 4:3 on aggregate to progress to the semi-finals. The boys from the hills then had a faceoff with Mohun Bagan in the semi-finals first leg but were very unlucky as they had a disastrous time against the Kolkata giants, who continued their superb form at home. For Saturday’s second leg fixture, Mohun Bagan are expected to start with the winning team from the previous leg with Sony Norde, Yusa Katsumi, Cornell Glen and Jeje doing what they do best upfront. Shillong Lajong FC on the other hand will welcome back Robin Gurung to the squad who served a two match suspension. The team will have only three foreigners at their disposal namely, Uilliams Souza, Fabio Henrique and Penn Orji. Thangboi will look to explore more options from his young squad and form a solid attacking line up in order to build a threat in their opponents half and convert all their chances on Saturday. Lajong had lost only a single game in this season and have either drawn or won matches at home but it will be a big challenge for the Reds to overcome that big margin set by Mohun Bagan. In the pre-match press conference, Singto said that the team has to finish the match on a positive note and have the faith and belief to get a good result in the end. Lajong has played and performed very well under pressure be it the last home game of the season against East Bengal or the second leg match of the Federation Cup against the same team in Kolkata. Singto explained that it will be a big challenge to overturn the score but the team has to play good football and fight till the end. 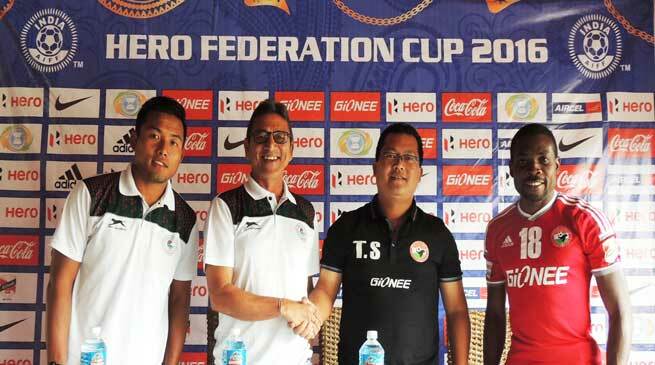 “As a team we would like to do well tomorrow and we need the support of the Lajong Faithfuls. Requesting all the football lovers to come and support the team”, he concluded. The experienced Nigerian midfielder Penn Orji who is taking care of captain duties has been in a rock solid form throughout and has played in every single minute of all Lajong matches this season. Penn who was also present at the press conference spoke his heart out and said that “Football is an unpredictable game and nothing is impossible. The score line set by Mohun Bagan is high but the team should have the faith and believe in themselves that anything is possible. If there is a will, there is a way. As footballers we need to do our duty and remain focused throughout the game. We should fight till the last minute. An interesting battle awaits in Shillong tomorrow when Lajong hosts Mohun Bagan in the Second leg Semi Final. The favourites, Mohun Bagan are expected to be full of confidence and composure to progress to the Final of the Federation Cup. Meanwhile, it will be a test for the Young team of Lajong to showcase their determination and ensure they don’t get knocked out without putting up a tough fight.